Famed Japanese artist Takashi Murakami just lent his signature psychedelic visuals to the latest Godzilla film, Godzilla Resurgence, according to Crunchyroll. Co-directed by Hideaki Anno (Neon Genesis Evangelion) and Shinji Hugichi (Attack on Titan), the 29th Godzilla movie has been promoted with Evangelion vs. Godzilla merch since April 1st as a nod to Anno’s role in creating Evangelion. The film will be released in Japanese theaters on July 29th. This epic mashup allegedly originated as an April Fools joke on the official Evangelion and Godzilla sites that proved too good to die. 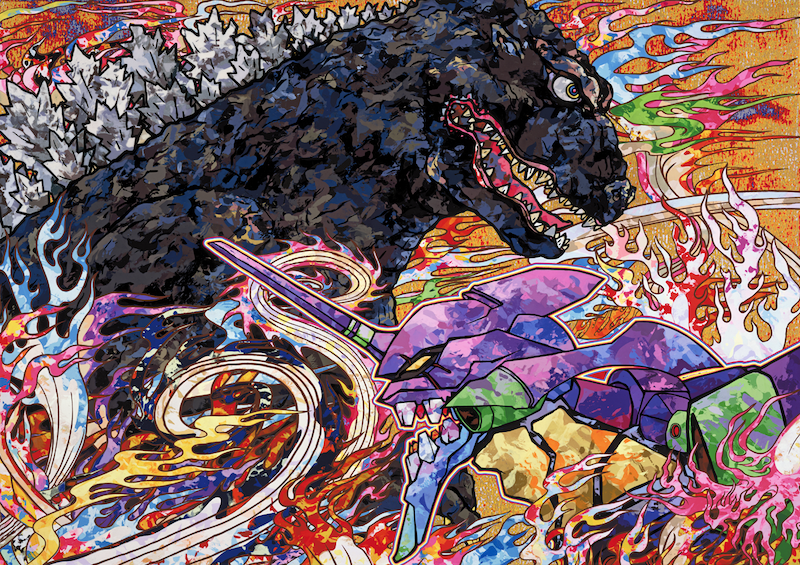 Ever since, promo merchandise pitting the giant reptile against Eva Unit-01 has been produced by artists like Mahiro Maeda (Nausicaä of the Valley of the Wind) and Yuji Kaida (Gundam). Murakami, one of Time’s most influential people of 2008, adds a kaleidoscopic spin to the monster-mecha action.